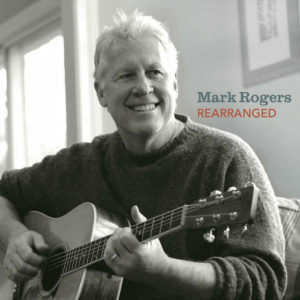 “Rearranged” – the debut EP by Mark Rogers was recorded and mastered at Master Sound in Virginia Beach, VA by Bob Ulsh and produced by Mark Rogers himself, Bob Ulsh and Larry Berwald, with Mark’s “dream team” of Tidewater, VA players, which they’re called by many. His music is acoustic guitar-based featuring well-crafted hooks, nice vocal harmonies, thoughtful lyrics, a bit of folk rock jangle and a pinch of bossa rhythm just for good measure. This EP features six, radio-friendly, three to four-minute acoustic pop songs, regardless of their genres. Mark Rogers seamlessly fuses everything together. In high school, he was a guitarist, bassist and tenor harmony singer for a popular DC-based bluegrass band called Tennessee Flying Goose. After college, he went onto Los Angeles. In the 80’s, he headed a Cosmic American band in LA and played some of the loneliest clubs in Hollywood. He put his guitar down in the 90’s and 00’s to raise a family in Washington, DC. In 2010, certain event led to his return to music. And that is where it gets interesting again with his first EP, which opens with the single “Right Here” and takes you through five more equally fantastic acoustic laden gems. The opener itself is one of the EP’s stand-out tracks and it doesn’t take long before it’s apparent that this is a seasoned veteran singer/songwriter who knows the ropes and can deliver on today’s musical terms. Rogers somehow manages to avoid the trappings of the current Americana trend with his own brand of folk and pop stylings. This becomes even more clear as the EP wears on, with the terrific sounds of “Slow Parade” with its narrative feel that draws you in and keeps you interested the entire duration of the song. It marks two hits out of the park, so far in the song order. “I Can’t Say Why” is a completely different animal that almost throws you off with his amazing songwriting prowess. This is a killer song that fights for every inch of the spotlight on this EP, but it does so in a sneaky sort of way. It stands up to everything on the release and might even be its magnum opus. It helps the EP play more like an album, which is a testament to its inclusion on Rearranged. And if that doesn’t change things up enough after just three tracks, then “Waiting” is just the ticket to get back on track and in sync with the EP, and this is where his songwriting, singing and playing meet with bands like The Eagles. That may or may not be an influence, but it’s a compliment either way, as thus far in the EP it’s cool to hear some throwback factors in the mix on a release with already so much to offer. On “Takes Me Back Again” there’s a lot of guitar showcased to define some of the bossanova mentioned about his playing. This goes to show that Mark Rogers can combine a wide variety of styles within one song, as this stands out as well as the vocals and lyrics to another well-crafted tune. And much of the same can be said for the vocal approach to the final track “The Blue Of December” as it checks out with the same high standards to be found everywhere on this fine debut release.